Pros: It helps to respond to customer queries on the whatsapp channel in real -time. It has the ability to synchronize all the posts, files(images, audio and videos) and these are used to understand the customer query and offer support. Overall: So far so good with all the above positive advantages not even exhausted. I recommend this software, it has helped so much to enable the brand divert it's traffic from the helpline to social media. Easy for real time, weekly and monthly reporting. Pros: It's very easy to use, and the interface feels "light". There a lots of automation options which will make your customer success teams much more effective and recudes response times. Cons: I would like to have bulk selection enabled, this makes cleaning up casengo a little bit tedious. But that's a minor issue. Overall: Rediciculously fast response time to incoming requests, and a boost in sales, because fast response is a big factor for choosing a software vendor like ourselves. Comments: We have Casengo installed on our website. As an online marketeer Casengo is a qualitative data goldmine. In our case visitors often ask us product questions before signing up and brutally reveal what information our website is lacking, or how our messaging needs a bit of tweaking. We can immediately reply (as casengo has a notification sound, subtle enough to notice, but smooth enough not to be annoying) and help visitors with whatever they need. After installing the Casengo plugin (which for a non techy person, is actually really easy) we saw an increase of sign ups for our product and could tweak our messaging which resulted in a raise of our conversion rate. Cons: - Interface can use a little bit of tightening up, but you'll notice these small annoyances only when you use it a lot. Actually gave them some feedback that is taking in on the roadmap! Comments: Easygenerator uses Casengo to manage all inquiries from prospects. It helps us divide the flow over several agents, that will work most of the time in different locations. Back in our Outlook days, we were struggling to manage and dividing the growing number of emails. That tension disappeared as soon as we started using Casengo. We can see right away which customers are still awaiting an answer. Assigning a case to someone works great, too, and so does live chat. We love switching from email to chats. My personal favorite however, is that Casengo is cloud-based and mobile-friendly. Pros: Cloud based, You can see if a case is handled by one of your colleagues and which colleague handles a case. You can also review the reactions and coach people on it. Cons: There can be some UI improvements. Browsing through cases for examples is not ideal. Comments: Casengo has a smooth, enjoyable, intuitive interface. It was easy to learn and easier to set up, but with all the functionality you would need for the prototype medium sized business site we were creating. Customer service was fast and friendly. Really enjoyed this product. Cons: We could not figure out how to shut off the notification ringer without closing out the call, but that may have simply been a problem at our end, since we were using a virtual machine and it was only for a prototype. Comments: As bussiness was growing, I was looking for a good customer management system, while piles of emails were giving me headaches. I came along Casengo wich is free for small bussiness (1 agent), but with all the features available! Emails, chat, twitter, faq. Pros: This is realy a great system, for free for 1 agent and affordable when your bussiness will grow to more agents. Small problems are quickly answered and solved by their very friendly helpteam. Joppe, thanks for your help untill now! Comments: At first, it was a little hard for me to get started, but with the help of the friendly Casengo team, I was able to get going with chat and Facebook! I'm now looking into integrating my email in the system. Thanks team! Pros: They provide excellent support! Casengo knows how to give good customer service. Try them out yourself! Comments: I was using Zendesk, but Zendesk adds attachments as downloadable links... My customers got confused and couldn't find the 'attachment' is was talking about - because it wasn't actually an attachment. Casengo just attaches the file like any other mail client, and I never had any complaints about missing attachments again. Pros: Attachments how attachments should work! Cons: Uploading multiple attachments could be easier. Comments: We had just opted for Desk.com when Casengo came along. I was thrilled to discover that this cloud application does not come with any unnecessary bells and whistles. It does exactly what it should do - so we switched! And we don't regret it at all: Casengo offers powerful functions that stimulate internal cooperation, and a good overview of emails yet to be answered. Such features make Casengo ideal for growing companies like ours. Comments: Casengo is great as a customer service tool. I really love the 'universal inbox' way of thinking. 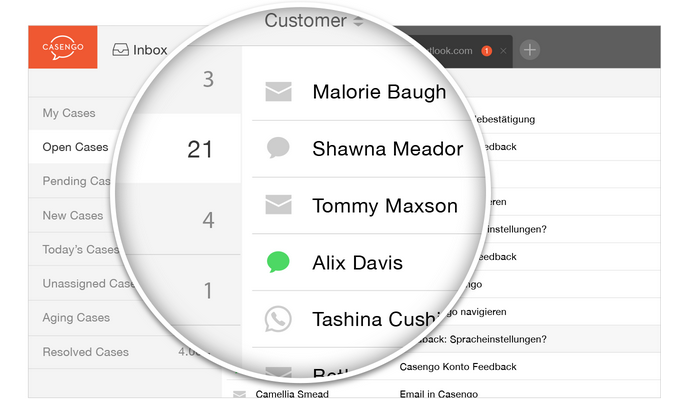 One inbox for email, chat, facebook and twitter - a good app to streamline my customer service! Cons: Can't wait for the Push-notification in the Casengo app. They just updated the app. Comments: We've been using Casengo for almost a year now to manage our customer emails more efficiently. Ever since, no more emails slip through the cracks. Casengo has been a major boost to our productivity and customer satisfaction. All of our online stores are now enriched with live chat, bringing in a whole new group of potential customers. Cons: Haven't found them yet. Comments: My client service is up and running, thanks to Casengo. I receive a lot of emails daily, and me and my team weren't able to track who was doing what, and who replied to what... With Casengo, all my email troubles are gone, because of the universal inbox!